If you’ve picked up this book, you have a fear like I do. Or else you desire to help someone who has that fear. This is not a book to make you enjoy speaking and putting on a show in front of strangers. This is a book to help you deal with shyness within the writing world in your own fashion. You do not have to speak at conferences. You do not have to be embarrassed at a book signing. You do not have to hawk your product and feel like a used-car salesman. Or you might have a desire to do all these things but do not know how to start. Your personality is your personality. You write because it meshes well with your character. You do not have to sacrifice yourself to fit someone else’s mold of a writer. Challenge is good for growth, but agony is unhealthy. The comfort level is yours to find. Here you receive pointers on how to maneuver in the writing arena without the social weight around your neck. And you will learn how to manage during times when you absolutely have to make appearances you cannot dodge. What you won’t receive is a message telling you to “get over it.” While Toastmasters is educational and worthwhile, it is not the cure-all. If you are shy and don’t want to “get over it,” this is the book for you. 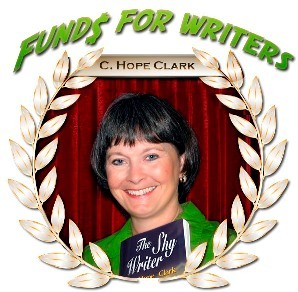 C. Hope Clark has published FundsforWriters.com newsletters, ebooks and web site for nine years. She’s published in Writer’s Digest, The Writer, ByLine, Chicken Soup Anthologies, TURF, NextStep Magazine and many more. Her web site has been a 101 Best Websites for Writers selection for 2001 through 2008. True to her nickname “Freelance Hope,” she provides weekly editorials in her newsletters that have writers clamoring to read each weekend. She is also a monthly columnist at Writersontherise.com, WOW-womenonwriting.com and Dabblingmum.com. Find out more about Hope, The Shy Writer and FundsforWriteers at http://www.fundsforwriters.com. 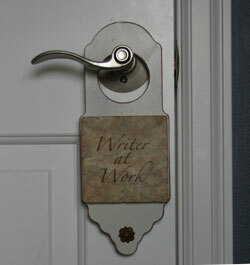 Made exclusively for Ninth Moon, this Writer at Work doorhanger is a gentle way to tell all who would disturb you that you’re behind a closed door for a reason. Laron Glover is owner of Ninth Moon (http://www.ninthmoon.com), a boutique store that provides “gifts to delight and tools to inspire” writers. Ninth Moon specializes in treasures (not trinkets) and has recently added a line of author promotional items (bookplates/labels/stationery). Laron is a writer mama herself–her “baby” will be starting kindergarten this year, which means she no longer has to compete with a 5-year old for her laptop. She admires all parents who manage to write around jelly-coated keyboards and temper tantrums in pursuit of their dreams. Today’s question: Last year I asked: Are you a shy writer? So it seems like I should come up with a new question. How about this, slightly tougher question: How much do you allow your shyness or introverted nature to be an excuse or impediment in your writing career? Have you found ways to overcome your shyness that might inspire others? Please share 50-200 words on how shyness has helped or hindered your writing career. So I’m grateful for the Internet, which has made it possible for me to have a writing career because of emails, social networks, instant messenger. The two books I’ve published aren’t something I can promote (one is a UK-only book and too expensive for shipping and the other is in a field that I don’t do much work for anymore). But if I had to go out there a promote them, it would be a struggle due to my fear of not understanding the audience. I think shyness is sometimes reinforced through practice. Since working as a writer, I’ve been able to stay at home, using emails to make connections, and I feel my old, introverted ways creeping back. So I make myself get out to conferences, workshops, and events and meet people, interact, pitch ideas, etc. Even if my palms sweat. While I would not consider myself shy, I am not super-extroverted, so I’m learning. Learning to ask people to pose one more time for the photo to accompany an article, learning to probe writer acquaintances with questions. Maybe it is more concern about inconveniencing others than shyness. Spending this fall in Mexico learning Spanish (and writing some!) promises to be an opportunity to work on getting myself out there communicating. If I can be outgoing in a new language, who knows where that will take me as a writer. Getting past my introvert nature has been a one stop at a time thing. I joined writing groups and just forced myself to read and comment. I blog and comment on others blogs. I just signed up for a writing course at the university which means driving into the city on my own, at night, which is something that scares me more than a bit. The next hurdle is writers’ conferences and querying agents. I don’t think the latter will be too hard as I am already sending out story submissions. The conference thing is a multi-dilemma/issue thing for me. Being away from husband and child, the travel, expenses and then the difficulty I have warming up in large groups. I get a bit “deer in the headlights” in crowds. But unless a person aspires to be Emily Dickinson, one has to go out into the world through all available mediums. I remind myself that I am a good writer. I have as much to say and offer as anyone else. What I want is not going to come to me. I have to go to it and make it happen. Having a child has helped me practice the art of talking to complete strangers. I do struggle with being shy sometimes. For me, at the core, it’s a fear of rejection. Which is difficult with writing because so much of it is about putting myself out there – to get the interview or to submit a piece to an editor. But my curiosity and impulsive spirit often trump my shyness. I find that if I get over that initial hurdle – make the call – send the e-mail (I do have to admit the internet has made it easier) the rest is not so hard. Sometimes I will give myself an incentive (chocolate is always nice). But mostly just getting out into the community and changing up my routine – going to a different place or joining a new group has helped me overcome shyness and be a better writer. And thinking of all the great writers who have had their share of rejection helps too. Ahh, introversion. It seems like writing should go along with introversion. All that lonely work, the words coming from the depths of your soul. So why do I have to get out there and sell my work? Bleh. I know how to speak in public. I was a teacher and it doesn’t scare me anymore, but I still seem to want to live in the shadows with my writing. Afraid of getting out there in the world. I’m getting rather tired of my shadow living self, though. Time to move on out. What do I do to get through public presentations? I sign up for it before I can chicken out. I gave a public reading of my novel excerpt last fall. The room was full of people mostly from my writers group, my family and some co-workers, but I was still pale and clammy. Not a good look for me. My son in the audience was getting over the flu and I told him “Just don’t throw up during Mommy’s reading, OK?” But my own stomache was flipping and flopping. I took a deep breath looked out from the podium and just began to read. The quiver in my voice soon subsided and the excitement for my material shone through! I’ve also done this with interviews. Make my list of questions, dial the phone and plunge right in! Talk about a rush! I wish I weren’t an introvert. And it’s crazy because I can get up in front of a room full of people and talk, teach classes, make speeches, debate, etc. It’s one-on-one that bothers me. So I have to say I really “shy” (pun intended) away from anything where I have to do interviews. Give me a mike and a podium, and I’m right at home, but put me across the table from someone, and I freeze up. I even forced myself to take a newswriting course hoping it would help me overcome my weakness. It didn’t. So it does intrude in my writing. I’d love to write feature articles, but instead I do fiction and try to do as much online research as possible. Although I have taught classes and learned how to feel comfortable in front of a room that is different from being comfortable sharing my writing. Maybe I am simply lacking confidence in entering this relatively new area for me. I do not like to read my writing aloud. I find myself rushing through it assuming that it must be boring for people to listen to. Also, I don’t know whether this is shyness or an unlearned skill, but I have a terrible time at meet and greet events where I don’t know anyone. I would prefer to just talk with someone I already know, not venturing out to meet new people. I hate the idea of networking. I wonder if these kinds of situations are addressed in The Shy Writer. When I was a kid, people called me “shy and brainy” so often I feared it might become my epitaph. As the fourth born in a spirited clan, I never really learned to speak for myself, because I never really had to. That’s why I began to write, I think. It was the only time I was free to be me, without anyone interrupting! I never shared my writing with anyone until I joined a writing group for cancer survivors two years ago. The thought of reading my most intimate thoughts aloud quite frankly appalled me, and as I entered the room that first day, I firmly resolved that while I would do the writing exercises with the rest of the group, nothing would induce me to share them. What changed that? I think it was seeing that the first intrepid soul who volunteered to read aloud received only supportive feedback. Now I love to read my pieces aloud to anyone who will listen, and I write about almost anything. I recently found the courage to take it one step further, and my very first piece was published last week! Until I was in 9th grade, I was incredibly shy, but didn’t know it. I just didn’t understand why people didn’t come up and talk to me. Really, I was just sitting there quietly in a corner, waiting for them. Then in 9th grade, I got involved in drama class, and through other’s words, learned how to be more extroverted. I was amazed at the power of words. I’ve never forgotten that feeling of shyness, of uncertainty. Even now, there are times I have to gather up my courage, and push myself to take the next step. I love the writing process, but sending out potential articles, or a query letter leaves my hands shaking. Obviously, this is a serious impediment to my writing career. I will keep pushing myself, keep striving, to get past this last fragment of shyness, and start sending out my work. Calling me an introvert is an understatement. I’m an agoraphobic with social anxiety and some OCD for seasoning. I feel very clumsy in my social interactions and I have a long memory for my failures. I think the impediment within my writing career isn’t just shyness – it’s a complete lack of confidence. I type up email submissions and let them wallow for days, staring at the screen for hours to get the nerve to hit SEND. That said, I’m a lot better at handling interaction via email than I am by phone. I’m terrible with phone calls, and it can take me forever to get up the nerve to do one (and inevitably I have to leave a message, beginning a bout of phone tag). At a writing conference earlier this year, I did okay and approached speakers and thanked them… though I think I gave out a grand total of four of my business cards. It’s always a battle for me, but at this point I can say that I’m battling. That hasn’t been true in the past. I’m still a little shy now. When I was younger and in school I was much more shy. I would rather write or send an e-mail if I have something difficult to say. I seem to trip over my tongue alot. I get so nervous that sometimes I forget what I was going to say. And with e-mails or with any writing, you can read over it and delete any mistakes. Unlike when you speak and something didn’t come out right or make sense. Something in the writing world that has helped my shyness is a on-line critque group. At first I was shy and sat back and watched awhile. I think I was more shy about giving them then getting them. I didn’t want to hurt anyones feelings. I try to be aware of how my nature is impacting my writing experiences. For instance, for several months I belonged to a writing prompt group. We would meet to chat, pick a writing prompt and then go home. We were to write about the prompt and share it with the other members if we wished. Other than the leader I was the only member to attend with any regularity. Some nights I really didn’t want to go and interact with anyone in person. But I made myself and nearly always I had a good time. It would have been so easy to not go at all or worse – sit there at the table in the coffee shop with other people and avoiding their eyes while trying to think of something to say. Neither of these alternatives were pleasant for me or the other members so I learned to ask questions and listen to the answers. Give me a podium and a mic and I’m set to shine. After years in Event Management and Public Relations, I turned to teaching (which is actually more event management and public relations). The publicity thing has always come naturally for me; in this area, I’m far from shy. But when it comes to approaching something new, pitching myself or my work, that’s where the shyness comes thundering down. Like a hurricane hitting my village, and I’m curfewed in my closest. I’m not just shy when it’s time to pitch or apply, I’m terrified. Like Julie P., I’m in PR, where there is no room for shyness. But unlike Julie, I relish the chance to pitch my writing or my PR agency. The motivation is simple – I truly believe that we’re one of the best virtual agencies in Silicon Valley and that our news releases and feature articles are superbly well written. It’s not just my writing that I’m promoting, but that of my amazingly talented freelance writers. I know that the more I get out there to network and promote our services, the better clients we’ll land and the higher billings we’ll bring in. More money means I can train and hire more writers and account managers. A bigger staff means eventually I’ll have more free time to work on my novel. If you want to build a freelance practice, you absolutely must demonstrate your enthusiasm for your craft and confidence in your work. If you don’t believe in yourself, who will? I definitely would not consider myself shy but I am introverted at times with my writing. It is easier for me to allow complete strangers to read my work than it is for me to allow people who know me to read it. I would never have a problem promoting my work or speaking in front of an audience unless it was filled with people I knew. What would you call this? A shy person? No. Not so much. I am at ease in a crowd and one on one, though NOT with public speaking. A shy writer? Yes! This I guess comes from lack of confidence in my own work. I ‘use’ this shyness as a comfortable, protective padding. It’s been a very new experience to share anything I have written to anyone, and I have only done that in a small way so far. Definitely shy to query. That is a bridge yet to cross. I check out heaps of “how to write” books from the library but I wish they came in brown paper covers so the librarian wouldn’t see and ask questions and assume I am actually working on something and getting something brilliant accomplished. I’m an introverted person and have shy tendencies, especially when I’m in a scene where I don’t know anyone. It was really hard in the beggining for me to conduct interviews, even over the telephone. I have to give myself a mental pep talk before hand. I remind myself that they’re people even if they are celebrities. They have jobs, families (that make background noises), and are probably just as nervous that they’ll mess up or say something stupid. Another thing that will help is to be prepared. Know what you’re talking about, plan what you’re going to say, and practice it. 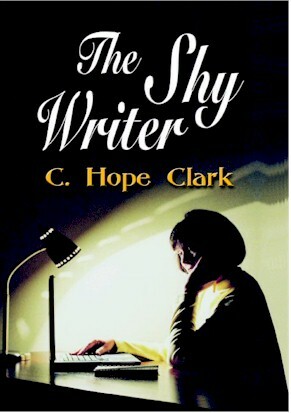 When I read the title “The Shy Writer” I gasped and thought, “This book is written for me!” Yes! I am a shy writer! Right now writing is a “closet” activity for me. Only my husband and sister know about my writing. The reason? I fear I will fall flat on my face. I’m in Christina’s WPSS class and loving it but this week we are to conduct an interview to improve and add life to last week’s articles. This assignment is a bit anxiety provoking for me. Well–my first challenge is getting up the nerve to make the contact for the interview. Yes, I can do it–I was out front and in the publinc during all of my career–but getting started with the interview will take extra will power and I know from experience that it once I get started it is fun. I do think that if (when?) I do get something published, even the smallest item, this success will give me courage to let at least a few friends know how I’ve been spending my time! Shy, introverted, hesitant–yep, that can be me … and sometimes I’m just unsure of myself. And yes, all of these “quirks” affect my writing. Being introverted also means I’m intropsective–and that’s a plus. It helps me “perk” on a writing idea. Being shy or hesitant or unsure–that can be a detriment to my writing goals. I accept my personality and work with it. Even though I am an introvert, I do like to get up in front of people and teach. I just need to allow enough down time to re-charge. I also take time to learn from others who know how to do things I don’t know–like how to conduct a radio interview better or how to teach a workshop that reaches the hearts of my audience. My shyness definitely impedes me the most when I have assignments that require phone and in-person interviews. There are just days when the thought of picking up the phone and calling a source makes me incredibly anxious. If I’m having a few days like that in a row, it starts to affect my work. What snaps me out of it? Deadlines! I never want to disappoint an editor I’ve promised work to, so I force myself to get over my shyness and get the interviews done. I started blogging over a year ago as a way to ease myself out of that shyness, and I think it has helped. I’ve made new friends and contacts that I never would have made if I hadn’t made the conscious effort to put myself out there. Thankfully, I don’t struggle too much with shyness or introversion, but I do have my issues with lack of confidence in my work — that is the real struggle. I spend a lot of time second-guessing myself, especially after multiple queries/ideas have been rejected. To get out of the self-pity party, I open my “bravo” folder. It’s a folder in my inbox with emails from editors praising my work. It’s the perfect remedy for squelching the seeds of doubt. I’ve learned to hide it pretty well, but I do have a shy nature. It’s one reason I love writing. I feel so much more comfortable being myself in my writing because I’m not face-to-face with my readers. When I was writing my weekly newspaper column, dealing with the “fame” that came with it (albeit small-town fame), I was often approached by strangers who were surprised I was quite a bit more reserved in person. (I am that way with strangers and a lot more fun and laid back once I get to know someone.) I am definitely not as shy as I used to be, and I think writing and having a public audience has helped a lot with that. In general, I am not a shy person, unless I am in a group of people whom I consider to be more qualified than I am at doing something. Hmm…sounds like a writers’ conference to me. As a new writer I haven’t had to go out there and sell my work yet. I would say at this point that I suffer more from lack of self-confidence than shyness. Realizing this helped me write to an editor to inquire about payment after reading some of today’s posts. Hooray and thank you! And it makes me think: why is it that we are suddenly “shy”, in a way, to ask for compensation for work completed? I know I am not the only one. Other posts and writers I’ve talked to have the same struggle. Do we feel somehow that our work is not worthy or important? Do we fear someone else might not think so? Do we fear being tagged a complainer or a nag? Hey, sounds a lot like being a woman in our society. Or a stay-at-home parent. While I do not suffer from shyness, I do suffer from a lack of confidence in my writing. It has kept me from taking the plunge, so I am still an unpublished writer. Unfortunately, I just can’t bring myself to consider the minutes I write for the local Planning Commission as a writing credit. Those motions and votes just don’t leave any room for creativity. Many of the previous posts have given me ideas and inspiration to help get me over the confidence hurdle. I appreciate the time everyone has spent to share their own experiences. I look forward to facing the challenge of getting published. And I’m not surprised at all the comments on being shy. I hear them so often – the fear, the hesitation, the lack of confidence. I have it all as well…the reason I wrote the book. I, too, make myself go to a couple of conferences per year…and make a presentation. It makes me deal with reality, and I always come away grateful for all the conversation and human connection. There’s something empowering making yourself step into a sea of people and perform. Especially if you are shy. It’s an elixor that’s hard to get to your mouth due to the smell, but once you take it, once you deal with people, the self-confidence jolt is amazing. Let me know how you like the book, Maribeth.